NBC 6's Amanda Plasencia has reaction from the family of the woman, who was suffering from medical issues and later died. 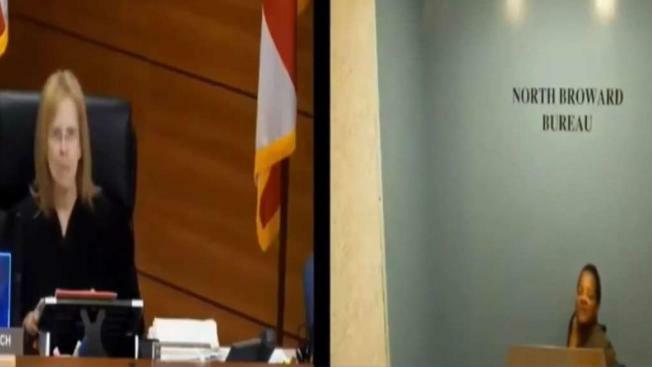 A South Florida judge is facing intense criticism after video shows her berating an inmate with chronic lung disease and asthma during a court appearance. Circuit Court Judge Merrilee Ehrlich was presiding over first appearance court last weekend when 59-year-old Sandra Twiggs appeared via a livestream feed from a north Broward Jail. Video shows Ehrlich becoming irritated when Twiggs tries to answer questions through fits of coughing and wheezing. "Excuse me, don't say anything beyond what I am asking you," Ehrlich says. When Twiggs starts coughing again, Ehrlich asks if she needs water. Twiggs nods "yes," then mentions needing a breathing treatment. "Ma'am, I am not here to talk about your breathing treatment," Ehrlich interjects. Twiggs, who was seen in a wheelchair during the proceeding, later died at her home in Lauderhill. Throughout the hearing, Ehrlich interrupts Twiggs several times, telling her to "just listen." Twiggs was released without bond, but Ehrlich's behavior incited several social media users, as well as Broward Public Defender Howard Finkelstein. "Ehrlich demonstrated aggressive and tyrannical behavior and revealed her lack of emotional fitness to sit on the bench," Finkelstein said in a letter addressed to Chief Judge Jack Tuter. "She raised her voice to many defendants, berated the attorneys, and was impatient and exasperated during the proceedings." Twiggs had been arrested on misdemeanor charges and had no prior criminal record. South Florida's NBC 6 has reached out to Ehrlich, who reportedly resigned, for a comment. Ehrlich submitted her resignation letter to the governor before backlash erupted over her treatment of Twiggs. Broward Chief Administrative Judge Jack Tuter said Saturday that Ehrlich was not to return to the courthouse. She was scheduled to retire this summer and had submitted her resignation letter before the encounter with Twiggs. The family has set up a GoFundMe account to help with costs for Twiggs' funeral.